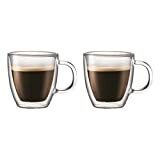 Elixir Double Wall Glass Large Coffee Mugs 2pc, Dishwasher & Safe is currently selling at $29.95, approximately $0.30 higher than average, giving a potential saving of $36.28 right now. With a lowest price of $28.95 and an average of $29.65 it is selling on the low end of its usual range. Price volatility is 0.74% (meaning it does not change often), so the price should stay low for a while. Right now this product is a recommended 'good deal'. There is a coupon available for an additional 10% off. 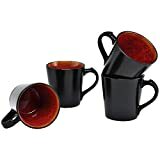 Compare the current price, savings (in dollars & percent) and Buy Ratings for the top Mugs that are closely related to Elixir Double Wall Glass Large Coffee Mugs 2pc, Dishwasher & Safe. Here is how Elixir Double Wall Glass Large Coffee Mugs 2pc, Dishwasher & Safe compares with other leading Mugs. Wake up to bliss with the extra large 16 ounce double walled, borosilicate glass mug by Elixir Glassware.
? EFFORTLESSLY PRACTICAL Keeps hot drinks hot and cold drinks cold, while preventing condensation and staying cool to the touch. Dishwasher safe and microwave safe!
? BLISSFULLY BEAUTIFUL Who knew that a coffee could be so entrancing to look at? You'll admire yours every morning in these beautiful cups.
? 100% SATISFACTION GUARANTEE At Elixir, our mission is to bring you the best in fresh & exciting glass drinkware. We absolutely love our products and hope you do too - that's why we're committed to the best customer service - from our family to yours. Don't risk it - make your next purchase an Elixir mug and say 'NO' to inferior, tacky Chinese alternatives. We won't let you down! SO WHAT ARE YOU WAITING FOR? Beautiful, smart, practical coffee drinking glasses - that's bliss. Act NOW and get yours today! FeaturesTHE IDEAL CAPACITY FOR YOU - Large 16 oz size is perfect for your favorite tea, coffee, chocolate or other hot beverage. Don't get up for a refill!KEEPS YOUR COFFEE HOT FOR LONGER - Double walled, hand blown glass insulation keeps your coffee hot and your hand cool. No sweat! Also works great for your favorite icy cold drink. Dishwasher & microwave safe.MESMERIZING ELEGANCE - Tantalise the senses each morning with these elegant cups. Make your drink look like it's floating in midair - an enchanting optical illusion. NOTE - does not work for humans. 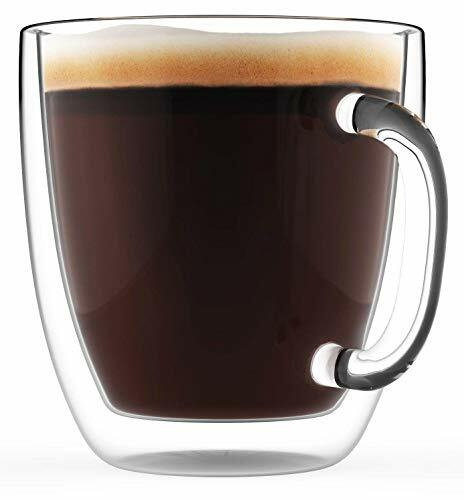 Please don't try to stand inside your glass!LARGE, EASY TO GRIP HANDLE - Because a big mug needs a big handle. Comfortable, wide opening and thick stem is perfect for sleepy or shaky hands.